I know, I know. This post has been long overdue. Partially because I was trying to decide how I wanted to write about my experience and partially because I've been super busy in my rotations so far. With that said, this post is not exactly about what type of resources I used or how I studied. 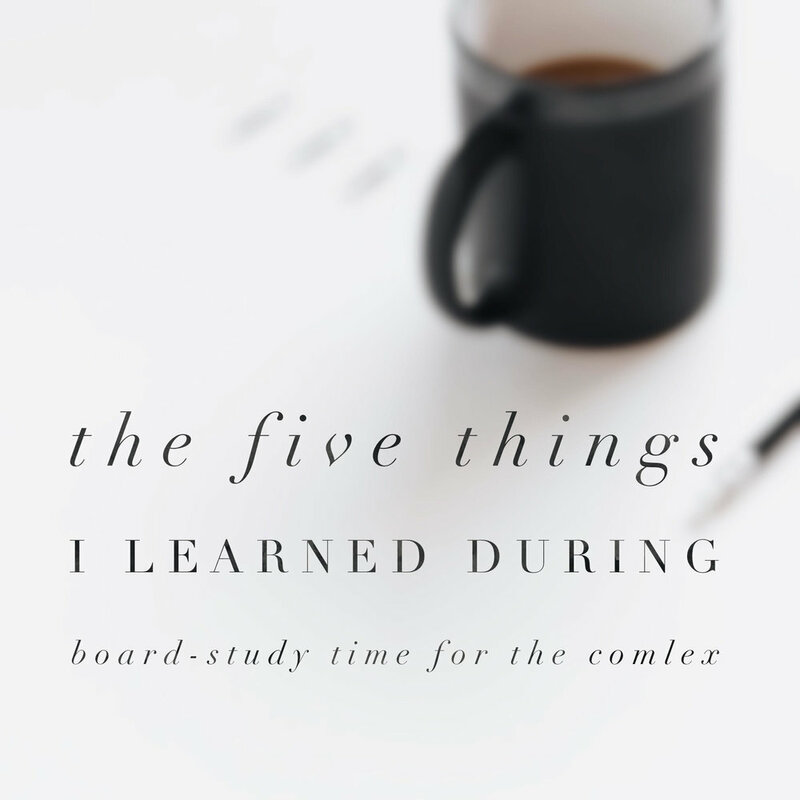 Rather, this post is more about what I learned throughout the process of board studying - about myself, my journey and the process of studying for this board exam. I hope you take away something meaningful from this post and that you find it helpful! If ya'll are interested in a specific post regarding how I studied - what worked and what did not work, let me know and I'll do a follow-up post to this one! Something that tends to go to the wayside when stress comes around is self-care. With the hustle and bustle of studying, I tend to get a one-track mind. What I mean is that I tend to only think of the specific task at hand and I neglect to eat healthy or exercise or just relax. Studying for the boards is a long process. Depending on each individual, the time that they take to study varies anywhere from 1 month to half a year. With this amount of time, self-care becomes important because you don't want to end up feeling awful, or sick, or just unhealthy in general. You know that feeling when you've been eating bad and not exercising and you just feel like crap? Yeah. A lot of that happened during this time, for me. That's when I knew that I couldn't let my health go to the wayside during this time. This doesn't just go for physical health. It also goes for mental and spiritual health. I had to make sure that I took care of all aspects because that helped ensure my sanity and success in the process. Don't get carried away by the competition. You'll hear about people's goal score, or their dream program, or how their study methods are better than what you're doing. DON'T WORRY and stand your ground. Avoid getting caught up in comparison and saying "they're better, and smarter than me", or even the opposite "oh I'm so much smarter than them". Let's just be honest, I'm more part of the first camp. I found myself from time to time comparing myself to other people and feeling inferior. I'm not naturally smart - I really have to work hard and put in the hours to learn things. I had to stay grounded and true to myself and not try to do what other people are doing, or think that I'm less than them. I just had to think positive and do my thing. I cannot stress how important this was. During my study period, I regularly met up with a group of girls and prayed together, talked about our stresses, and even lend a shoulder to cry on (should out to my girls). This was the best thing I literally did because it helped me stay grounded (as I mentioned above) and remember what I'm really doing this for. I was reminded that I'm in medical school to become a future doctor that will serve others. Doing this truly helped me to keep things in perspective and remember my true purpose. If you ever feel like you're losing sight of your goals and dreams, just remember your "why". It was so easy to get caught up in the studying, and doing this or doing that to fine tune your study method. But honestly, just trust the process. Sometimes things will click right away and sometimes it doesn't. Just because it didn't click right away doesn't mean you have to change the method right away! Trust that what you're doing is what YOU need to be doing. Otherwise, you will waste time and energy trying to work and re-work your schedule, study method, and what have you. This is not the time to do it (unless you REALLY REALLY NEED TO meaning, you've evaluated, taken practice tests, talked with your academic advisor, etc). Now THIS is what got to me a lot. You will find that you will talk to you peers and you'll come across a few people who will swear up and down by THEIR method and how only THEIR method works. This is simply NOT TRUE. Everyone has a different style of learning which means different study materials/resources will work for different people. I couldn't tell you the perfect combination of these materials, and I couldn't tell you that they're perfect either, but all I can tell you is that what I did worked for me and for what I needed. Try your best to not get influenced or caught up by what others are doing during this time, and take everything with a grain of salt. As I mentioned earlier, trust the process and that everything will work out as it needs to!